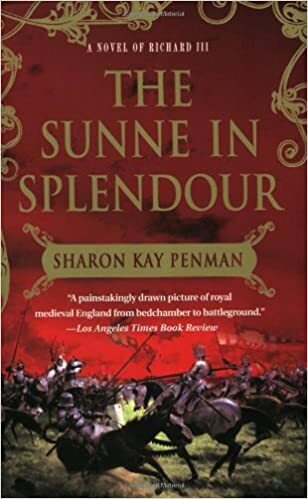 My friend Barb, who knew of my curiosity on the topic, recommended I read Sharon Kay Penman’s historical opus, The Sunne in Splendour, a historical novel about Richard III. Now that I have, I’m glad I did, but the book is not without flaws. The novel is steeped in scholarship, and Penman’s painstaking research is obvious on every page. From the use of now-obsolete or obscure terms such as “garderobe” and “oyer and terminer” to descriptive bits about daily medieval life, the book is detailed in its descriptions. Unfortunately, Penman sometimes takes this a bit too far. Dates are obtrusively plunked into the narrative, and Penman’s attempt to make the dialogue sound archaic quickly becomes tiresome. As example, the word “be” replaces “is” in many places throughout, as in “You be well aware that…”, “It be only that I would not see you hurt,” and “It be sweet of you to worry about me,” three quotes pulled from the same scene. The author throws in other archaisms, too, albeit with less frequency, but overall they comprise an irksome feature to her dialogue. Anne had expressed confidence that Edward would relent, had promised that Richard would keep on urging Edward on her behalf. This sentence structure appears on every page, usually multiple times. Worse, it appears in dialogue, too. In everyone’s dialogue. Thus, every character sounds like everybody else, and everyone sounds like the narrator. There on July 11, George Neville, Archbishop of York, had wed George to Isabel Neville in open defiance of Edward’s wishes. Edward had been furious by the marriage, Richard disconcerted. Having to deal with the plethora of Edwards, Georges, Richards, Elizabeths, Annes, and Cecilys was also a challenge for Penman, but one she handled passably well by using nicknames and honorifics. All this carping aside, for the student of history — or the inquisitive mind searching for an explanation for Lady Anne’s behavior in Richard III, act 1, scene 2 — this book is a must read. Most people only know of England’s King Richard the Third — if they know of him at all — as the evil hunchback who murdered the Princes in the Tower. Twisted of mind and body, he is the incarnation of evil. One fairly expects to see a cloven hoof, were he to but take off his boot. Simply put, Shakespeare’s Richard III is Tudor propaganda written by an author living under Tudor rule and dependent on royal favor, a mere hundred years after the actual events took place. Richard III was, from start to finish, a lie designed to sway the audience whilst it entertained them, and which used as its foundation every low opinion and high rumor to libel the last Plantagenet king and bolster the Tudor’s rather sketchy claim to the throne. Richard, Duke of Gloucester, King of England, third of his name since The Conquest, was not a perfect man, but his greatest flaw was that of loyalty and trust given to those who neither deserved nor respected it. A daring commander, a man of dignity and self-restraint, Richard was merely the last man standing after his relatives spent decades participating in bloody internecine warfare and blatant selfishness that brought about their own early demise. For Richard, betrayal came from every quarter — from friends, from relations, and seemingly from God Himself — in a time where betrayal among the powerful was commonplace, and bad luck was seen as evidence of Divine Judgement. The secret of Lady Anne is this: she loved Richard deeply, as he loved her, for years before they married. They were devoted to each other, they stayed true to each other despite Anne’s being traded to the Lancastrians like a late-career pitcher in the off-season, and, after once they finally wed, they maintained a close and loving marriage that lasted thirteen years, ending only when Anne died of consumption. The true tragedy of Richard III is that his vanquishers so expertly rewrote his history that most of the world knows nothing of his real story. For that reason alone, this book, despite its flaws but by virtue of its accuracy, is a recommended read. As a writer, I learned from Penman’s missteps, but enjoyed the depth of her characterizations and the truth revealed by her work. Shakespeare’s Richard III is a masterful portrait of pure ambition and concentrated evil, but it isn’t history. A friend told me that there’s a book by Gregory that follows Bess, Edward’s daughter and wife of Henry VII. The White Queen, I think it was. One surprise for me was the hatred that pretty much everyone harbored for the Woodvilles. Not well liked at all. Isn’t it wonderful to have the light cast upon previously dark and mysterious places? I enjoy discovering a new twist on history that makes more sense than what I’ve been taught. Zinn’s “A People’s History…” was a revelation. Sorry the prose was such a bummer. There’s another book in my stack which purportedly dashes myths about the founding fathers. That should be a good light-shiner, too.